Burlington High School students confer ahead of a school board meeting to discuss potential budget cuts. 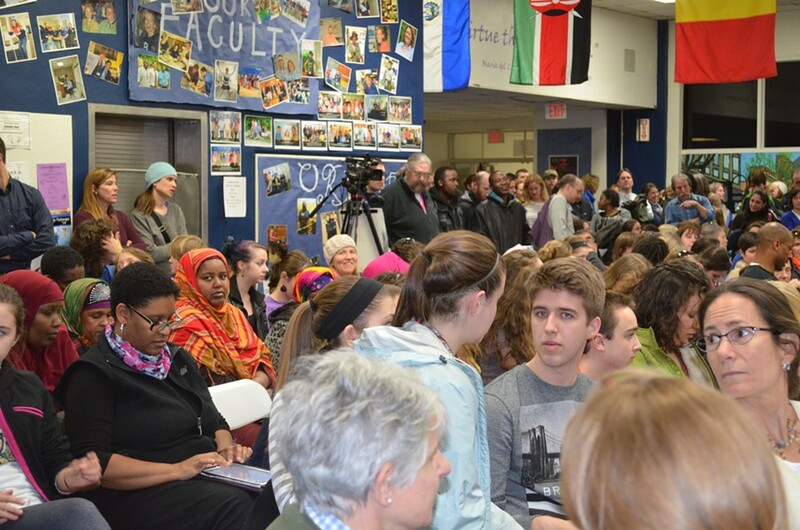 The Burlington School Board meeting on Tuesday began with an announcement about how to evacuate the building. And no wonder: Students, parents and teachers flooded the meeting to caution the board against budget cuts — in particular, those that would eliminate teachers. The rest of the night, however, entailed a lot of counting. A long procession of teachers — several on the verge of tears — came before the school board, each emptying the contents of a plastic bag on the table next to them. These were the teachers, generally in their first or second year, whose jobs are in jeopardy; their names have landed on the “reduction in force” (RIF) list, which identifies 48 positions that could be cut. The teachers had brought wooden blocks — one for each child they teach — to demonstrate how many youngsters would be impacted by their absence. The board hasn’t made any decisions about staffing cuts yet, and it doesn’t plan to until after six new board members take their seats next week. In addition to the RIF list, Superintendent Jeanne Collins has supplied members with a number of suggestions for scaling back programs to save money after voters on Town Meeting Day rejected a $67 million budget that would have raised taxes by nearly 10 percent. Among the potential reductions is a proposal to reduce kindergarten classes from full days to half days. “The day is barely long enough now,” Suzy Tenenbaum, who teaches kindergarten at Flynn, told the board. Collins put forward three options for reducing the proposed Fiscal Year 2015 budget. The first, which she’s endorsed, would cut $857,000 from the budget voters rejected in March. The other two would reduce it by $1,501,000 and $4,124,000, respectively. These options are outlined in the school board agenda here. Some people asked the board to hold off on cuts entirely, and put the same budget that was struck down before voters a second time. On Town Meeting Day, 4,118 Burlington residents voted against the $67 million budget , while 3,424 voted for it. That ratio was not reflected in the turnout on Tuesday; only a handful of people spoke out in favor of budget reductions. Dave Maher urged the school board not to overlook that vote tally. "The thing the school board needs to keep in mind is that for every four people here who support going back to the voters with the same budget that was rejected, there's five, 10, 15 out there who are going to vote against it." Putting an identical budget forth, Meyer said, "would be an insult. For the most part, teachers at Monday's meeting kept their remarks brief, allowing students and parents to make the case for preserving their jobs. Burlington High School students, some with printed-out speeches, others reading from their smartphones, urged board members to take their teachers’ positions off the chopping block. Anthony Miles, a senior at BHS, said his history teacher, Jessica Little-Hayes, “had an incredible impact on me. She was able to connect with me on a personal level, which rarely happens.” Miles said he also credits her letter of reference with helping him get into his top choice of colleges. The Integrated Arts Academy (IAA), one of the city’s two magnet schools, had an especially large presence at the board meeting. The magnet school coordinator, the IAA “arts coach,” and a handful of other teacher positions are on the RIF list. The meeting Tuesday also served as a call to arms for those who want the school board to bring a budget back to voters instead of defaulting to the current year's spending plan (which would still carry an 8 percent tax hike). Christopher Hood, a member of the Burlington Friends of Education, which advocates for passing the school budget each year, said the group will be doubling down on its efforts this time around. Other parents volunteered to stand outside grocery stores with flyers, or go door-to-door to convince neighbors to vote yes on the budget.